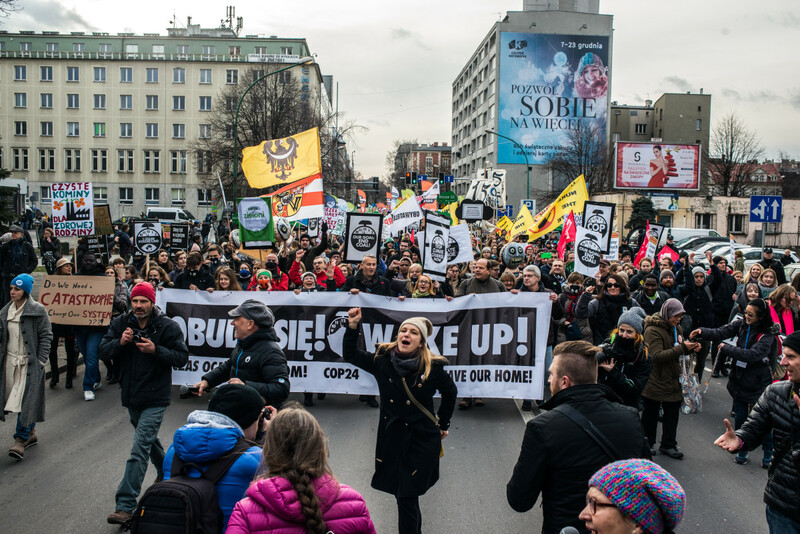 Protesters demonstrate on the sidelines of the 24th Conference of the Parties to the United Nations Framework Convention on Climate Change (COP24) summit on December 8th, 2018, in Katowice, Poland. At least 12 members of civil society groups and at least one member of an official delegation to this year&apos;s United Nations climate conference have been denied entry to Poland or deported. Some were stopped at airports, others pulled from trains, and several were given paperwork to sign in languages they didn&apos;t understand. So far, only one person, Zanna Vanrenterghem, Climate Action Network Europe&apos;s climate ambition project coordinator, has been allowed re-entry after the Belgian embassy intervened. Vanrenterghem was on a direct train from Vienna when, 30 miles outside of Katowice, border patrol officials entered her car and scanned her passport. Soon, four officers sat in the seats around her and told her she was being denied entry into Poland. She was escorted off the train and taken to what she believes was a border patrol facility, where she was able to call CAN officials and the Belgian embassy to ask for help. The Polish officials who detained her were unable to tell her why she was being turned away. Nugzar Kokhreidze, a member of the Georgian delegation, arrived at the Katowice airport last night and was stopped at passport control, where officials told him his name was on "a list of dangerous persons." Officials at the airport told him if he flew back to Georgia on Tuesday, he could return eventually, because "this measure was only for the COP," but if he refused and challenged them in court, he could be deported and banned from Poland for five years. These denials and threats of deportation appear to be related to a sweeping new surveillance law passed by the Polish government earlier this year, specifically related to the U.N. climate conference. The law banned unplanned protests within the city of Katowice, and included provisions that allowed Polish authorities to gather data on conference attendees. It was immediately criticized for putting undue pressure on activists and human rights defenders, according to Chiara Liguori with Amnesty International. Even before the conference began, Liguori says, the new law was already exerting a "chilling effect" on potential participants, with many activists from the Global South, who had to apply for visas, electing not to participate. According to Liguori, Polish authorities&apos; enforcement of the law and efforts to turn away COP participants at the border violate the Aarhus Convention—an international agreement ensuring the general public has access to environmental negotiations. Poland, which has ratified the convention, is, Liguori says, "committed to providing access to information, access to participation, and remedy on environmental matters, and so this is a clear breach of that, but also of general human rights obligations of freedom of expression and freedom of participation." "This is really important in this time and climate, because we are in a moment when everybody needs to be heard," she says. "This is really about the future of everybody, and new restrictions are really against what needs to be done at the moment. Climate non-governmental organizations knew before the conference began that the Polish government would implement new security measures, according to Goksen Sahin of Climate Action Network Europe, who says that organizations were "not informed that this means they have a blacklist of people." Sahin says CAN still doesn&apos;t know what specific criteria landed any of the 13 individuals who were turned away on that blacklist. "I personally know two people who were turned away," Sahin says. One was a German organizer who had participated in a climate march in Poland in 2013—the last time the COP was held in the country. The other is Vanrenterghem, who has never participated in climate actions within Poland, but who helped to organize the Claim the Climate March in Belgium last week, which attracted more than 65,000 participants. 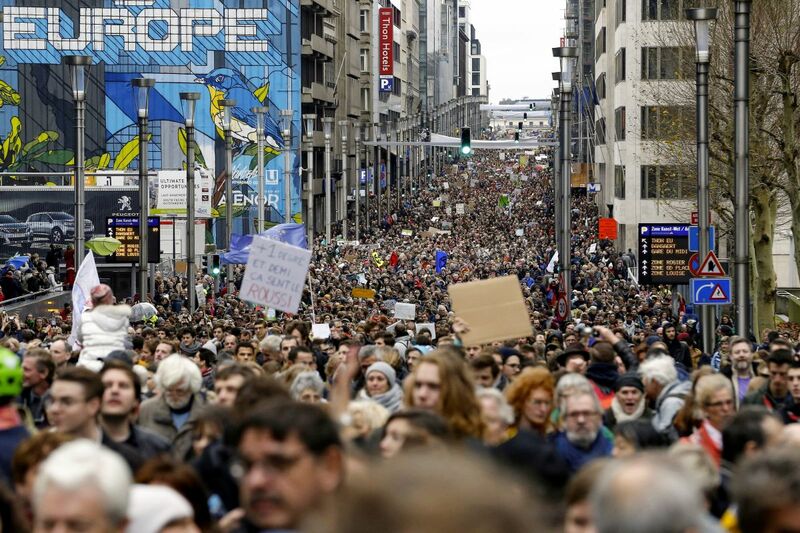 Participants in the Claim the Climate march on December 2nd, 2018, in Brussels, Belgium. 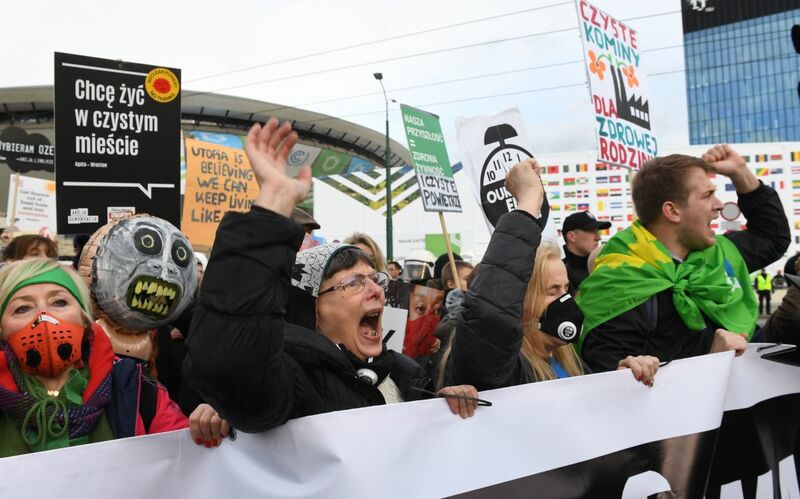 Vanrenterghem says she believes Polish authorities wanted to keep her away from Saturday&apos;s Climate March in Katowice—the only approved demonstration outside of the conference center—which she&apos;d said on Facebook that she planned to attend. She finally arrived in Katowice just as the march was beginning, but, still shaken from the night before, decided not to risk attending the protest and losing her U.N. badge if anything went wrong. Heavily armed Polish police, some with tear gas canisters, stood guard every few feet along the roads where the march took place. "I&apos;ve never seen this amount of police at any demonstration in my life, and I&apos;ve been in a lot of them," says a campaigner with Protect the Planet, a German non-governmental organization. "The first 10 rows is just, like, half the Polish police." 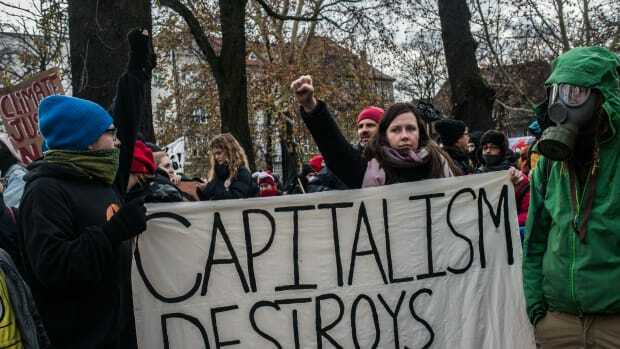 The march began at noon on Saturday and proceeded with little incident until about 2 p.m., when police officers stopped three members of the antifa bloc at the rear of the march, and the rest of the protesters paused to wait for their release. While the march was still delayed in front of the conference center, Vanrenterghem was inside, swarmed by colleagues who were eager to see her after the ordeal. During her detainment, Vanrenterghem had spent so much time with the officers that, when they stopped at a gas station for food and the attendant asked if she wanted to buy a hotdog, one of the guards told him, "No, she doesn&apos;t eat meat." "At no point did I feel threatened," she says. "Of course, I was scared when they sat in the train next to me, gave me no information, put me in a van. ... But [the guards] were completely nice. 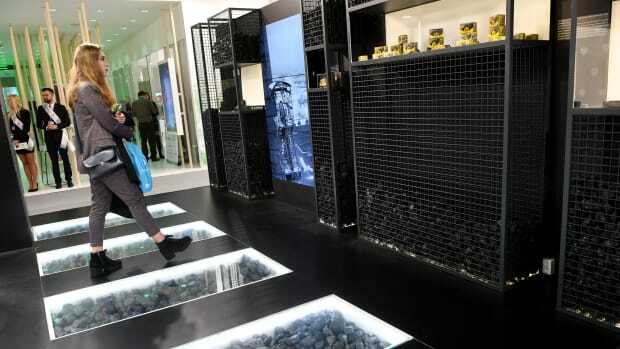 They also didn&apos;t seem to know why I was there." She was on the platform waiting for the train when the guards got the call that she would be allowed to stay in Poland after all. The officers even helped her pick out a hotel on Booking.com. Kokhreidze, meanwhile, is still in detention at the Katowice airport, in a room with a table and three beds, though he&apos;s the only one currently staying there. He says the accommodation is "not normal, but not bad"; it&apos;s especially noisy at night with all the airplanes. And Kokhreidze still has no idea why he is on a list of dangerous people. "It&apos;s not the first time for me being in Poland," he says. "My last visit was two months ago, and I never had a problem with the crossing—not in Poland nor in any other borders, and I travel a lot." A Polish woman dances during a march at the 24th summit of COP24 on December 8th, 2018, in Katowice, Poland. He plans to work from the hotel until his flight on Tuesday if Poland doesn&apos;t reverse its decision to keep him from entering, and in the meantime he&apos;s calling on "the Polish government to change the decision, and give me the possibility to do my job and participate with my delegation in the negotiating process," he says. "This is why I came here." "Poland and other countries in the European Union are tending to become much less democratic in ways that are very subtle to a certain extent," Vanrenterghem says, "but keeping people from a climate conference like this, there&apos;s nothing subtle about it." "It is extremely alarming," Sébastien Duyck, a senior attorney with the Center for International Environmental Law, said in a press conference on Saturday, "because it really demonstrates that the government of Poland has not yet awakened to the concept that actually the only effective climate action ... is climate action that builds on public ownership, and with public support." 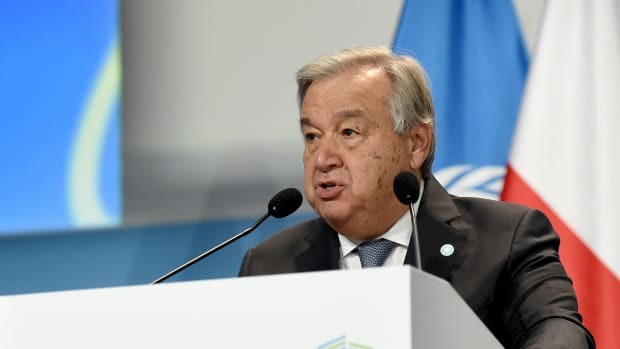 "We need effective participation of all voices in the process," Duyck said, "otherwise there will be no effective implementation of the Paris Agreement." 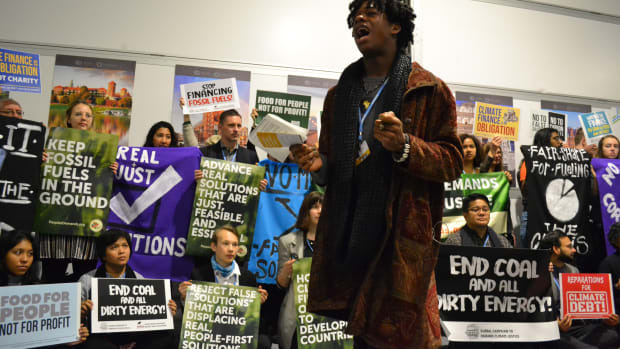 Amnesty International&apos;s Liguori says that&apos;s why her organization and others are here at COP24 advocating for human rights and protections for participation to be included in the Paris rulebook. "We&apos;re just asking to use the language that was already included in the preamble of the Paris Agreement, and to translate this into the rulebook to ensure that human rights and the right to participate are actually included in what countries need to take into account when they design their climate policies," she says. "It&apos;s not going very well." "In the past week, we&apos;ve been extremely alarmed by the evolution of the negotiating text," Duyck said Saturday. 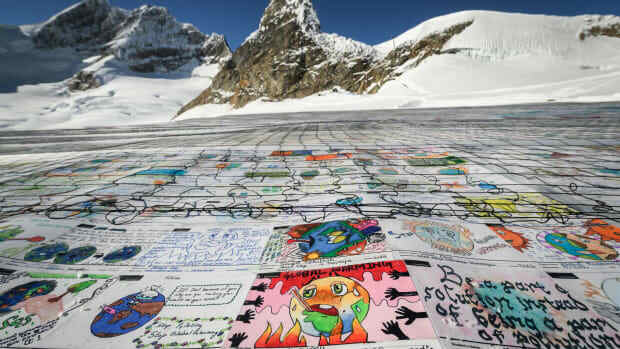 "The social dimensions of climate action have been systematically stripped out of most relevant aspects of the Paris Agreement guidelines." 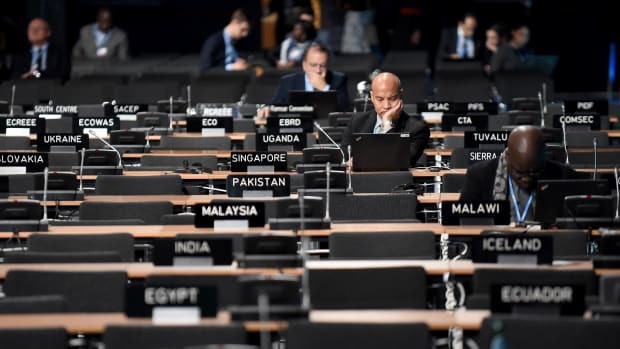 The first week of negotiations on the Paris rulebook closed on Saturday. In the coming week, ministers will arrive to settle the final details.